My White Zombie is the perfect cocktail for Halloween, complete with skewered bloodshot eyes and blood drips. I’ve taken the classic White Russian and added some bloody drips and some (store bought) eyeballs. You could easily make your own eyeballs with balls of white fondant icing and some edible marker pens. But life is too short. The classic White Russian cocktail is made with vodka, Kahlua (coffee liqueur), and cream served over ice. Sometimes the cream gets swapped out for milk – but I like to do a mix of half and half so its got a slightly velvety texture without being too rich. Real mixologists would carefully layer the cream and coffee liqueur so you get a two tone effect. But I’m too lazy and it all tastes the same so I just give it a good shake in my cocktail shaker. Giving it a good mix does thicken up the cream slightly too which I love. 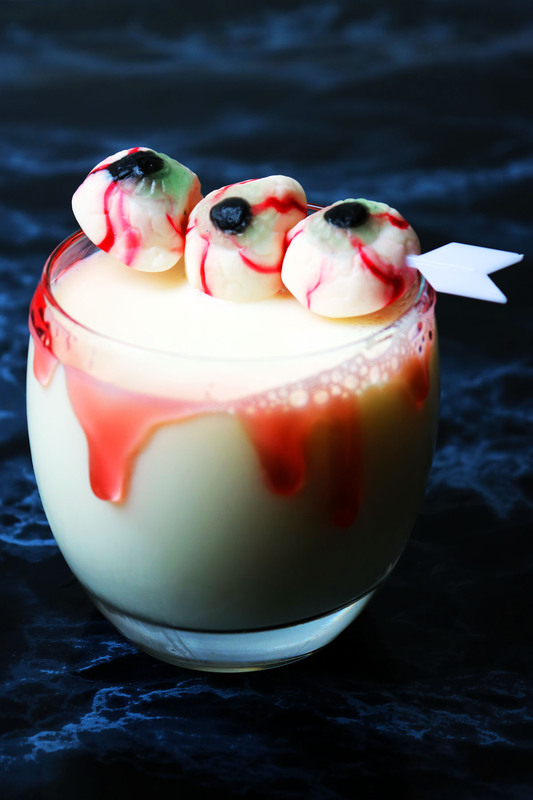 The classic White Russian cocktail has had a Halloween makeover with bloody drips and bloodshot eyeballs. Mix the honey with a little red food colouring until it is your desired shade of blood red. Using a teaspoon carefully drip the bloody honey around the edge of the glass. Pour the vodka, coffee liqueur, cream and milk over ice in a cocktail shaker. Give it a good shake for 2-3 minutes before pouring it straight into the bloody glass. Skewer a few bloodshot eyeballs on to a cocktail stick and place across the rim of the glass before serving. Take your Halloween party to the next level with these tasty treats. Wow, these look properly spooky! And they sound just my sort of drink too, though the eyes might scare me away! Haha love this! Those red drips around the edge are so effective!